This year has been one of the busiest since we opened, and that means that I have been working non-stop, not that I’m complaining. I love what I do, I love helping people heal, and feel pampered. What this does mean however, is that leading and training my team has become quite difficult. I’ve been running around trying to do everything, and that is why, with my deep apologies this newsletter is late. With any team from different cultural back grounds, there will always be struggles to understand each other and to have empathy with one another about how and why we do and act in certain ways. Bring in the political side and with elections coming up, is there inevitably a lot of tension, not only in our country but in our homes, our workplace and just in general. Keeping this in mind, managing effectively can be quite trying. So, in another exciting development at Woodlands, I am bringing in an Industrial Psychologist to coach my team. I feel that I have done a good job at leading them this far, but as a small business owner, especially one that is also the Spa manager, Financial manager, Marketing manager, Front desk manager…. all in one, I feel that I am doing my team a disservice by not providing them with the assistance they require. The team has, since we started in 2015, grown from 6 employees to 25 – this is a massive success, and I do believe in delegation. April is the month in which we celebrate Freedom Day, and I believe that by giving myself freedom to focus on other areas of the business, such as the Academy (more on that later), I will be a better leader, person, and business owner. The Woodlands Academy will be opening soon, we are in the process of getting SETA accredited, which is no easy feat. The course will be a 1-year Health and Skincare certificate, not only doing massage, facial, waxing, manicure and pedicure training, but we will be doing a module on Emotional Intelligence, as well as how to become an entrepreneur and what you need to become a successful leader in your field. Empowering the students to receive training in a trade, but also to offer them important soft skills that most of them so desperately need. 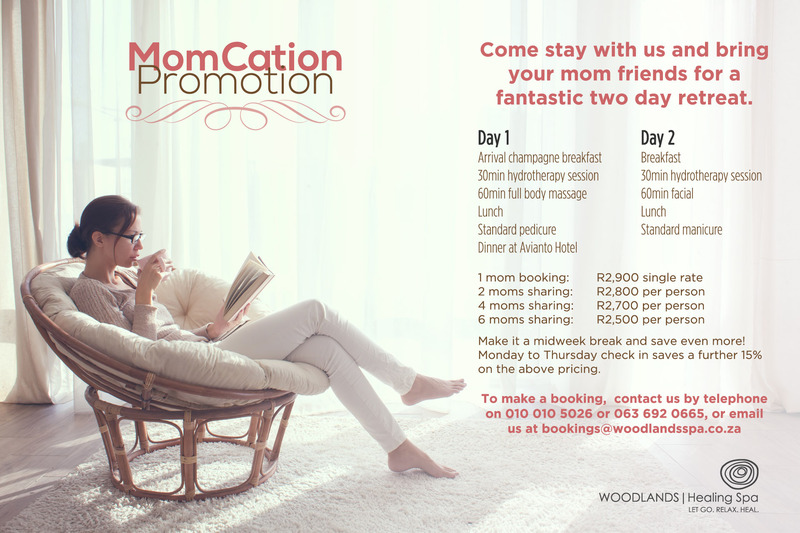 Don’t forget that our MomCation offer is still on – so if, like me, you feel a bit tired and in need of self-pampering, please make a booking. Whether you bring some of your mom friends, or even come by yourself, take the time to look after ‘Mom’ and your children and family will thank you. Feel like you haven’t laughed enough recently? Why not join us this Saturday the 6th of April from 10am to 11am for our very first Laughter Yoga session. Booking your space is essential. Book now by calling the instructor Tullio directly on 082 598 7540. Limited space available. I hope everyone has a joyful April and Blessed Freedom Day on the 27th of April.